HDTV Supplys WolfPack Modular Matrix Switcher Add-in Cards are for HDTV Supplys WolfPack line Modular Matrix Switchers which are a group of high performance video and audio modular matrix switchers. Listed above are changeable input and output cards which make the matrix extremely flexible and allowing it to be an all-in-one solution for a variety of different projects. The matrix card cage is designed so that it can support a variety of different video signals with cross switching. There are multiple groups of interchangeable WolfPack cards designed to work with the matrix. All of these WolfPack cards are designed to support hot plug & play and each of the WolfPack Modular Matrix Switchers can be used with any of the input and output cards for signal conversion. The ports can be HDMI, DVI, HDbaseT and VGA and we can mix and match ports...it's completely customizable. There are two groups of interchangeable cards designed to work with the; the Input cards series and the Output card series. All of these cards are designed to support hot plug & play. The cards provide connectivity and processing for different video signal types: HMDI, DVI, VGA, and HDBaseT™. Each of the WolfPack series matrix units can be used with any of the input and output cards for signal conversion. Call us at 800-841-9238 configure a custom unit for you. There are multiple groups of interchangeable cards designed to work with the matrix; the Input cards series and the Output card series. All of these cards are designed to support hot plug & play and each of the above Modular Matrix Switchers can be used with any of the input and output cards for signal conversion. 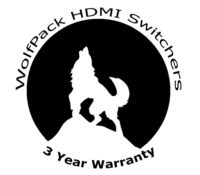 Wolfpack HDTVANI315XL Transmitter & Receiver: The HDMI Extender over single CAT5e/6 incorporates an IR and RS- 232 signal transfer for a more efficient system setup and is easy to install. Uncompressed video and audio can be transmitted to distances of up to 196 ft (60M) @1080p 115 ft (35M) @4K and supports High Definition Audio and 3D signals. Designed with HDBaseT™ technology for greater flexibility in custom installations with full HDMI and control signal transfer over a single CAT5e/6 cable. Wolfpack HDTVANI605XPLBD Transmitter & Receiver: The HDBaseT-Lite™ HDMI over single CAT5e/6/7 with bidirectional IR, RS-232 & bidirectional PoC Transmitter and Receiver set can make your home or office set-up more efficient and easy to use. Uncompressed video and audio can be transmitted up to 60M with the PoC function and added benefit of controls through the built- in RS-232 and IR ports. This family design of HDBaseT™ technology allows a full usage of HDMI and controls over CAT5e/6/7 cable. Wolfpack HDTVANI705XBD Transmitter & Receiver: The HDMI over CAT5e/6/7 Transmitter and Receiver set can send uncompressed video/audio and IP data over an single run of CAT5e/6/7 cable up to 328 ft/100M. It has the added benefit of control through the built-in RS-232 pass-through and 2-way IR control and a LAN serving connection. Additionally, it has bidirectional Power over Cable (PoC or POE) functionality that allows for greater flexibility in installations. Wolfpack HDTVANI705WPR Wall Plate Receiver: The CAT5e/6/7 over HDMI Wall-Plate Receiver can receive uncompressed audio/video over a single run of CAT5e/6/7 cable up to 100M with PoE, IR, RS-232 and LAN. of a data transmission rate of 100Mbps. A True HDBaseT 5Play™ solution to make your home or office more efficient and easy with control.™The WolfPack Modular Matrix Switcher comes in three different models, all of which provide the same basic functions. The input and output cards work with all of the modules. The major difference between these models is the number of card slots they provide. HDTV Supply ships these cards from our Texas warehouse so place your order at the above ADD TO CART button or call us at 800-841-9238 to place your order. 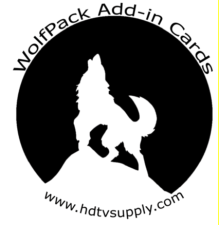 HDTV Supply includes a 3 Year Limited Warranty on these WolfPack Cards. The warranty states that the WolfPack Modular cards will perform substantially in accordance with the accompanying written materials for a period of 3 years from the date of receipt & that the WolfPack cards will be free from defects in materials & workmanship under normal use. In order to get a warranty replacement for a defective card HDTV Supplys Support Team will verify the product is eligible for a warranty. An RMA number will then be issued. Shipped replacements will be in like new conditions, tested & all components included. HDTV Supply also may sell a 5 Year warranty for this product. Please go to 5 Year Extended Warranty to see it. NOTE: These special order built cards for the WolfPack matrix switchers are not in stock as we custom build each unit and then we do a burn in. The cards have a three year warranty and are non-returnable and non-cancelable due to it being a custom built switcher. HDBaseT transmitters and receivers are not interchangeable between manufacturers. Also call us at 800-841-9238 to configure for you.